Mayor Toni N. Harp Wednesday honored a group of Southern science students – including a New Haven Promise Scholar — for earning a bronze medal at a recent international synthetic biology competition. 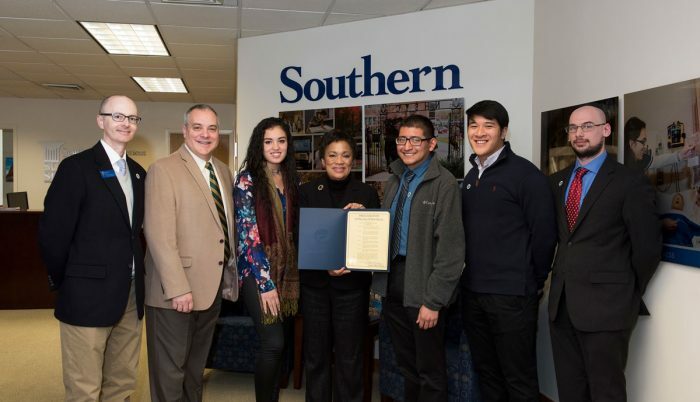 Harp presented the SCSU students, as well as faculty and administrators, with a proclamation at a ceremony at Southern on the Green, located on the 10th floor of 900 Chapel St. The event included nearly 300 teams of students – mostly undergraduates, but some graduate students and high school students. It marked the first time Southern competed in the program, and SCSU was among only three teams from Connecticut to do so this year. Yale University and the University of Connecticut also earned bronze medals. Julio Badillo, an SCSU student and a New Haven Promise scholar, was a member of the team. The students’ accomplishment was so inspiring that it brought one of Badillo’s former teachers to the ceremony. Lana Rowan, a teacher in the New Haven Public Schools, was Badillo’s freshman biology teacher when he was a student at the Connecticut Scholars Academy, a sub school of Wilbur Cross High School. Rowan said she was told about the ceremony by Richard Therrien, science supervisor for the school system, and she immediately expressed an interest in attending, along with Therrien. Several of the students presented a synopsis of the team’s work during the ceremony. The project was the latest example of a partnership SCSU forged in 2015 with the city of New Haven, as well as the region’s bioscience industry. The agreement, named “BioPath,” calls for SCSU to expand its bioscience offerings and to work with area school systems in the development of curricula to prepare them for college-level programs in the biosciences. The biosciences are an important economic sector for Connecticut, employing nearly 25,000 people statewide. The Greater New Haven region is the No. 2 bioscience cluster in New England with companies advancing the science in oncology, antibiotics, rare disease treatments and other specialties. Notable companies include: Alexion, Arvinas, Achillion, Melinta and BioArray. As part of the BioPath agreement, the city has agreed to assist with grant applications that would help pay for equipment and other expenses, as well as promote the new SCSU programs with local businesses, and to assist with internships for SCSU students at biotech companies. SCSU opened a new, high-tech science building before the start of the fall 2015 semester that has provided students with more research and laboratory opportunities in areas such as biology, biotechnology, chemistry, physics, earth science, marine studies and more. The team sought to develop a screening test for TB that is both accurate and speedy. The more accurate tests today require a wait that can take several weeks before learning the results. The DNA materials that the team generated have been sent to a repository where future college teams from around the globe can use to advance this effort. In addition, Thomas Hoang, a member of the SCSU team, will seek to finish the project on his own after securing an SCSU undergraduate research grant. Many students think graphic design is all about technology – the software programs like Quark and InDesign that are bread and butter to graphic designers – and not so much about problem solving. But this semester, students in Alex Girard’s Principles of Graphic Design (ART 215) course learned differently. Girard, an assistant professor of graphic design in the Art Department, challenged his students to have a positive impact on the life of someone else, to and use creative problem solving to make it happen. “My two main goals in the course,” Girard explains, “are for students to see how much impact a graphic designer can have on perception, and to explore mapping a solution from start to finish.” At the end of the semester, students presented their projects to the class to practice professional presentations of creative ideas. In the assignment, students were challenged to identify a problem, the problem’s audience, a concept for the solution, and to establish measurable benchmarks on a timeline. The project was very self-directed. Girard wasn’t asking his students for a highly refined design solution but was more focused on concept and process. Critical thinking skills came into play. Girard was particularly impressed with the thoughtfulness with which his students developed their topics and projects. They “tackled some brave issues, and did some really positive work,” he says. One students’ project was about stopping racial slurs, for instance, while another’s was about teen suicide. Girard says the 12 students in the class supported each other and challenged each other as they worked on their projects, but also respected each other. Speaking as a graphic designer himself, Girard says, “Graphic design is never about you – you are the conduit of something external. 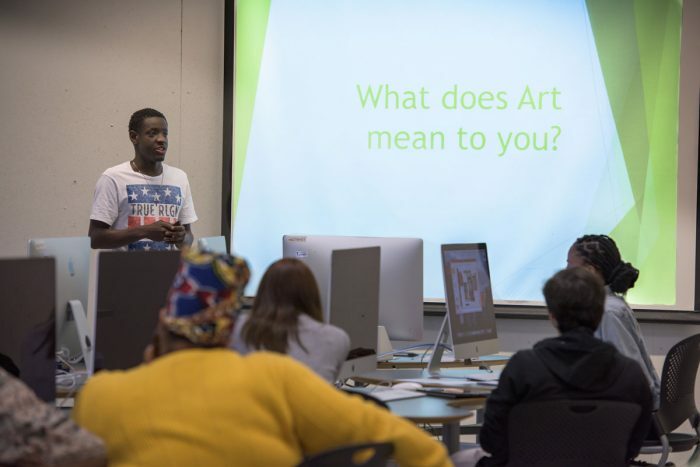 Your job is to see the world through someone else’s eyes.” One of the reasons he likes teaching graphic design at Southern is its liberal arts environment. He says many graphic design programs are very technology-focused, but the liberal arts education Southern students receive teaches them to communicate well with others and think about the world broadly. “It’s important to help students beyond just design sensibility and technological competence,” he says, adding that he thinks about what his students will be doing next, beyond college, and talks to hiring directors and art directors to find out what they’re looking for in potential employees. One key skill he often hears them ask for is the ability to communicate well. 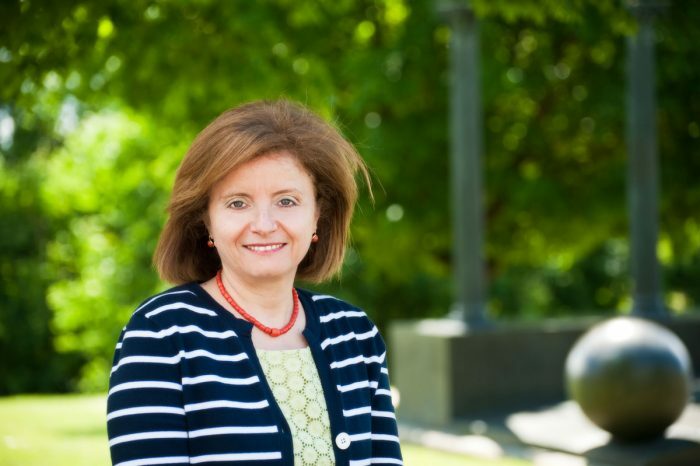 Pina Palma, professor of Italian, has been chosen by the Faculty Scholar Award Committee as the recipient of the 2016 award. Palma’s application, consisting of her book Savoring Power, Consuming the Times: The Metaphors of Food in Medieval and Renaissance Italian Literature (University of Notre Dame Press), was found to be “outstanding and impressive” by the committee, chaired by William Lunn, associate professor of human performance. The committee was particularly impressed with the quality of journals that had positively reviewed Palma’s book, as well as the breadth of her work and her candid inclusion of negative reviews to balance positive critiques. Palma earned her Ph.D. at Yale University and is a member of the Connecticut Academy of Arts and Sciences. She will be honored at the Celebration of Excellence event during the spring semester. 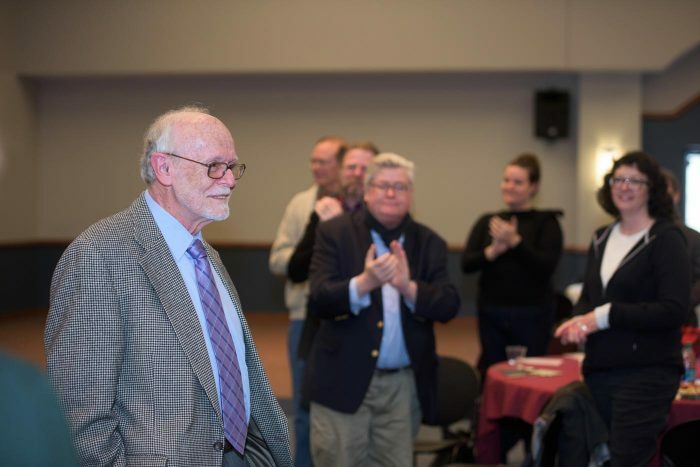 Terrell “Terry” Ward Bynum, professor of philosophy at Southern and founder of SCSU’s Research Center on Computing and Society, was honored December 5 as Southern’s newest CSU (Connecticut State University) professor, at a ceremony in the Adanti Student Center Ballroom. The CSU Professorship is one of the most prestigious faculty awards within the Connecticut State Colleges and Universities system. The state Board of Regents for Higher Education announced Bynum’s selection earlier this fall. Southern, Central, Western and Eastern Connecticut State universities each can have up to three such professors. Bynum fills an SCSU vacancy left by the recent retirement of James Mazur, who was named as a CSU Professor in 2010. Bynum joins Southern’s current CSU Professor, Vivian Shipley, who is a professor of English. A third CSU Professor at Southern, Joseph Solodow, recently retired, leaving a vacancy. Bynum is the first member of Southern’s Philosophy Department to receive the title. Bynum would go on to write books on computer ethics, as well. “He is considered to be, by more than one scholar, the ‘founding father’ of the field,” Paddock said.